1867~1879: he started his career at an early age, playing in his village's countryside Kabuki troupe. He was spotted by the travelling actor Bandô Kachô, became his disciple in 1875 and received the name of Bandô Hidenosuke. The following year, he became disciple of Arashi Kichisaburô IV and received the name of Arashi Rinshi. 1879: while on tour in the Ishikawa province, he had the chance to meet the star Ichikawa Udanji I and joined him. He settled in Ôsaka and performed under the name of Ichikawa Fukunojô. 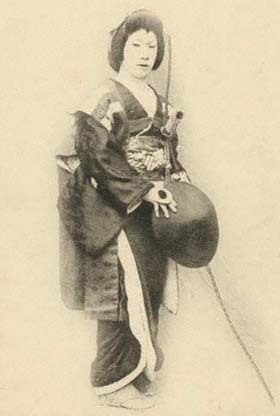 May 1885: Fukunojô went to Tôkyô with the Torikuma Shibai troupe; he played at the Harukiza the role of Chiyo in the drama "Sugawara Denju Tenarai Kagami". 1885 ~ 1888: Fukunojô was the tateonnagata at the Harukiza. He was spotted by the Edo star Ichikawa Danjûrô IX and became his disciple. November 1888: Ichikawa Fukunojô took the name of Ichikawa Metora II at the Ichimuraza, performing in the drama "Musashi no Yoroi Homare no Ôkubo". March 1891: premiere at the Kabukiza of Fukuchi Ôchi's drama "Buyû no Homare Shusse Kagekiyo", a revised revival of Chikamatsu Monzaemon's jidaimono "Shusse Kagekiyo"; Metora played the roles of the daughter of the daigûji of the Atsuta Shrine, Kagekiyo's daughter Princess Hitomaru and Shigemori's sister Kochô [casting]. April 1897: premiere at the Kabukiza of Fukuchi Ochi's drama "Otokodate Harusame Gasa"; Metora played the role of Gennoshin's daughter Otsuru, later the keisei Usugumo [more details]. October 1897: premiere at the Meijiza of Fukuchi Ôchi's drama "Ômori Hikoshichi"; Metora played the role of Princess Chihaya [casting]. May 1898: Metora played at the Kotobukiza the role of Otoku in the drama "Domo Mata"; the role of Otoku's husband Matahei was played by Nakamura Tokizô I.
April 1899: Metora played at the Kabukiza the role of Yoshitsune in the dance-drama "Kanjinchô"; the roles of Benkei and Togashi were played by Ichikawa Danjûrô IX and Onoe Kikugorô V.
July 1901: Metora played at the Engiza. the role of Shizuka Gozen in the michiyuki "Yoshinoyama"; the roles of Tadanobu and Hayami no Tôta were played by Sawamura Tosshô III and Sawamura Tosshi VII. March 1903: premiere at the Kabukiza of the drama "Kichirei Soga no Ishizue", which was produced to celebrate the shûmei of Onoe Kikugorô VI, Onoe Baikô VI and Onoe Eizaburô VI; Metora played the role of Kewaizaka no Shôshô [casting]. June 1904: Metora played at the Tôkyôza the roles of Shizuka Gozen and Osato in the classic "Yoshitsune Senbon Zakura". March 1906: Tsubouchi Shôyô's drama "Hototogisu Kojô no Rakugetsu" was produced for the first time in Tôkyô, at the Tôkyôza; Metora played the roles of Omatsu and Tokiwagi [casting]. January 1909: Metora played at the Meijiza the role of Shigenoi in the drama "Shigenoi Kowakare"; the role of Shigenoi's son Sankichi was played by Metora's son Ichikawa Otora IV. June 1910: Ichikawa Metora II took the name of Ichikawa Monnosuke VI at the Kabukiza, playing the role of Okuni in "Izumo no Okuni". 1912: tour in Chûbu with Ichikawa Yaozô VII and Arashi Kichisaburô VI; Monnosuke played the role of Otoku in the drama "Domo Mata", which was notably staged in February in Nagoya (Suehiroza) and in July in Hamamatsu (Kabukiza); the role of Otoku's husband Matahei was played by Ichikawa Yaozô VII. April 1913: Monnosuke played at the Tôkyôza the role of Shizuka Gozen in the "Shi-no-Kiri" scene of the classic "Yoshitsune Senbon Zakura"; the roles of Tadanobu, Minamoto Yoshitsune and Yokawa no Zenji Kakuhan were played by Onoe Kikugorô VI, Ichimura Kamezô III and Kataoka Ichizô IV. October 1913: revival at the Kabukiza of the drama "Zôhiki", a spectacular drama belonging to the Kabuki Jûhachiban; Monnosuke played the role of Princess Yayoi [more details]. August 1914: Monnosuke appeared on stage for the last time, at the Kabukiza, playing the role of Sôgorô's wife in the drama "Shin Sarayashiki Tsuki no Amagasa". He suddenly fell ill and died the 20th of August 1914. Ichikawa Monnosuke VI was a pure onnagata actor (jun'onnagata), excelling in the roles of merchant daughters or princesses. He was not born in the Kabuki world but he worked hard and succeeded in becoming a great actor, thanks to the support of Ichikawa Udanji I in Ôsaka or Ichikawa Danjûrô IX in Tôkyô. He was said to be very dissatisfied to be an onnagata and his son was trained to become a tachiyaku. When he was still named Metora, he gave his son the name of Otora, the O in Otora meaning male and the Me in Metora meaning female. It was made clear that his son would never become an onnagata. Without calling it a twist of fate or a crossing of the lines, the heirs of Ichikawa Monnosuke VI were Ichikawa Sadanji III and Ichikawa Sadanji IV whereas the heirs of Ichikawa Sadanji I were Ichikawa Monnosuke VII and Ichikawa Monnosuke VIII.